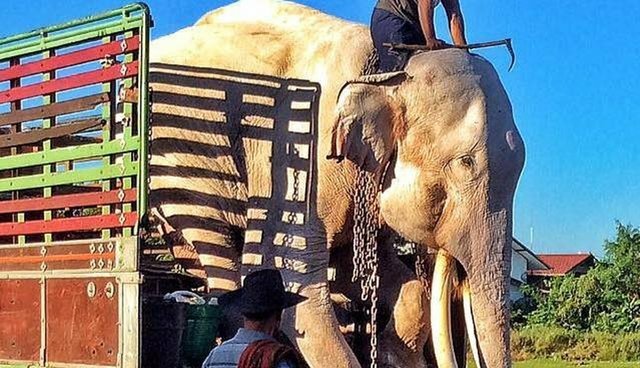 Legendary Elephant Has Spent His Life In Chains. Tomorrow, He'll Walk Free. Thong Bai, a giant bull elephant, is known as a beautiful symbol of the Surin province in Thailand. He's starred in movies. His image is used to advertise Thai beer. And all along, Thong Bai, this beloved and beautiful symbol, has been living in chains. This is the plight of many majestic animals, who inspire such awe that people decide to possess and exploit them. But there are other people who are genuinely concerned for Thong Bai, not as a symbol in need of preservation, but as an individual with a life story, with feelings. When these people discovered Thong Bai in chains, they were determined to figure out a way to help him. "Last year I invited Khun NuNa Silpa-archa to visit him and other elephants who live in Surin province," wrote Lek Chailert, famed elephant advocate, on Facebook on Tuesday. "After she saw him, she began to seek a way to help him and to bring him greater respect and freedom." They pushed for his owners to reconsider how Thong Bai has been living, and everyone worked together to design a home fit for Thong Bai. Finally, they found a place for him - The Surin Project, a center for elephants who have previously only known captivity. People built Thong Bai an expansive enclosure that would let him shed his shackles for good. He'll be able to stand in the sun, and in the shade. He'll be able to roll in the mud. Now, Thong Bai's chain-free shelter is ready to welcome him. Tomorrow, he'll no longer wear a chain.